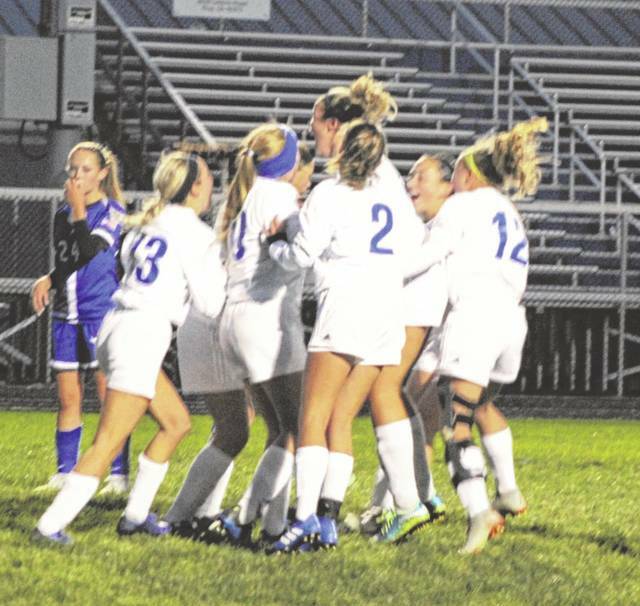 The Franklin-Monroe girls soccer team celebrated after scoring a goal against Miami East on Tuesday night in the Division III sectional tournament. Miami East won the game 5-1 to advance in the tournament. Franklin-Monroe junior Chloe Brumbaugh works the ball up the field surrounded by several Miami East players on Tuesday night in the Division III sectional tournament. Miami East won the game 5-1 to advance in the tournament. 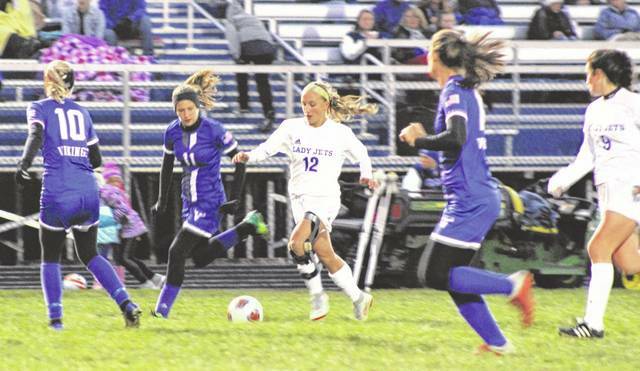 Franklin-Monroe freshman Maya Diceanu works the ball up the field against Miami East on Tuesday night in the Division III sectional tournament. Miami East won the game 5-1 to advance in the tournament. Franklin-Monroe senior Shelby Bowser battles for the ball with a Miami East player on Tuesday night in the Division III sectional tournament. Miami East won the game 5-1 to advance in the tournament. 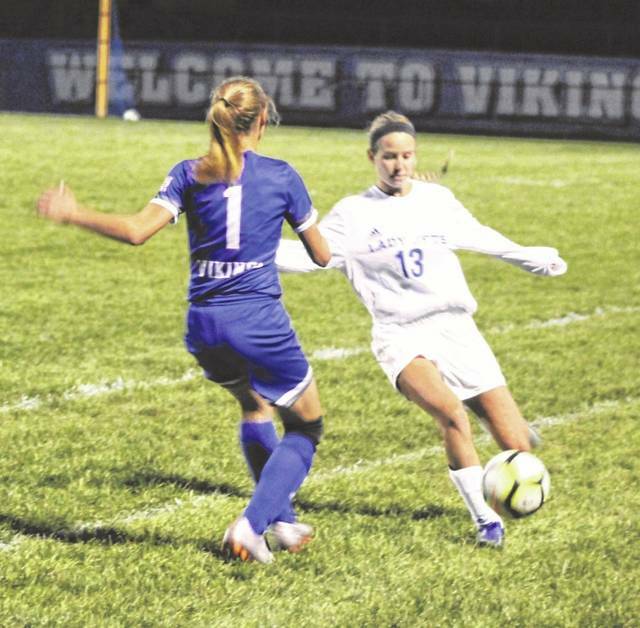 CASSTOWN – When freshman Maya Diceanu scored the first goal of the game to give Franklin-Monroe a 1-0 lead over Miami East in a Division III girls soccer sectional tournament game on Tuesday night, it set off a celebration on the field. 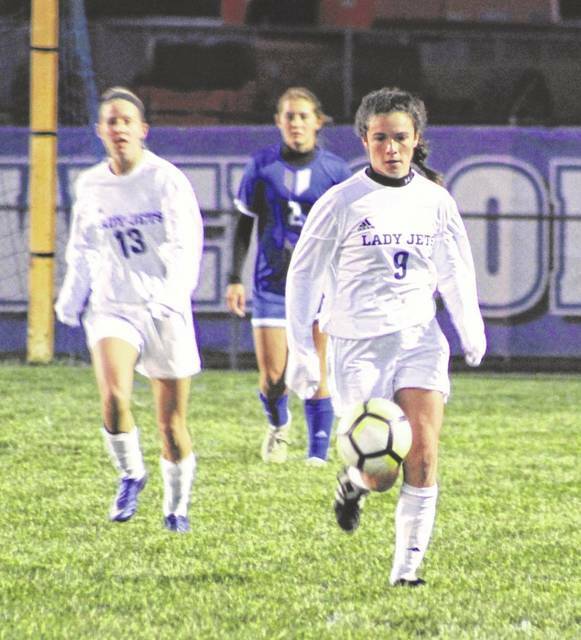 It was the first goal the Lady Jets had scored against the Vikings this season – they lost 5-0 to Miami East in the regular season – and it had them fired up. They were so fired up that for the next 17 minutes the Lady Jets played their hearts out and kept the Vikings in check. But with 7:40 left in the first half, Whitley Gross put one in the back of the net to tie the game and the Vikings scored two more times before the end of the half en route to a 5-1 victory. They advance to face Milton-Union in the next round while the season came to an end for Franklin-Monroe. The Lady Jets (3-14) had several other scoring opportunities, but just couldn’t get anything to go in. Coach Danny Diceanu was proud of his teams’ effort, but was also disappointed in the outcome. “We played real well for the first 28 minutes or so,” Coach Diceanu said. “Maya and the girls were pretty excited when we scored that goal. We really played very well the first half especially going into the wind, but we made a couple of mistakes and gave them a goal. “One of their goals was that nice long shot,” he continued. “Give her 100 shots like that and she might make that once again maybe because it was more luck than anything else with it hitting off the post on the far side, but then the other ones we didn’t manage to clear and get the ball out of there and left it in the danger zone and they capitalized so give them credit for it. The Lady Jets have four seniors who played their final game in a Franklin-Monroe uniform. They are Lilee Fisher, Kirsten Zink, Shelby Bowser, Peyton Archer. As for the season overall, Coach Diceanu said he saw progression. “We don’t have a lot of subs and some of the girls don’t have a lot of soccer background with last year being the first year playing for some of them so they are learning on the run,” he said. “They’ve adjusted and have done real well developing and getting better, but the other teams are ahead of that so it’s hard to catch up with experience. All you can ask is that they play hard which they did and let the chips fall where they may.